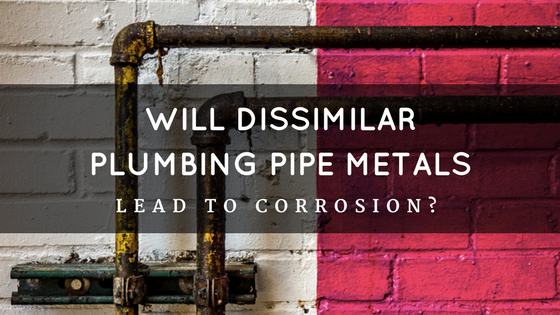 Will Using Dissimilar Plumbing Pipe Metals Accelerate Pipe Corrosion? Pipe corrosion is the enemy when it comes to your plumbing system, and while acidic water and plumbing pipe corrosion are two of the biggest threats to plumbing systems, the types of pipe materials within the system can also cause problems. Most notably, dissimilar metals can cause accelerated corrosion under the right circumstances. There are three commonly used metals for potable water plumbing pipes, including stainless steel, copper, and brass. These metals are used because of their durability and long lifespans. However, mixing these metals is not generally advised due to the potential for sudden pipe corrosion and discolored water. Stainless steel is a common plumbing material for water mains and fittings because it has an exceptionally long lifespan and is resistant to corrosion. However, that is not the case if stainless steel is directly connected to copper. This is because stainless steel and copper are dissimilar metals. When two dissimilar metals are directly connected together, the lesser of the two metals experience galvanic corrosion. When stainless steel is directly connected to copper, copper galvanic corrosion occurs. Though, there is some debate as to whether the copper corrodes or the stainless steel. According to Copper.org, the stainless steel plumbing pipes corrode. According to PHCP Pros, the copper corrodes because the stainless steel is a more noble metal when compared to the copper. Connecting stainless steel plumbing pipes to brass fittings and pipes is risky. Unless you know the specific types of stainless steel and brass, it should be avoided. This is because only certain types of stainless steel and brass can be used together. For reference, metals should have no more than a .15V to .25V on the anodic index or metals that are extremely close together as listed on the index. In the case of stainless steel (410) and brass, they are seven metals apart, which means they would be likely to corrode if connected directly. When it comes to stainless steel (301, 304 and 310) and brass, they are only two metals apart. Three conditions must be met in order for galvanic corrosion to occur, according to Corrosion Doctors. Two or more dissimilar metals must be located within the system. There must be electrical contact between the dissimilar metals. Only use similar metals within the plumbing system. Never use dissimilar metals when installing the plumbing system, including fasteners, hangers, bolts, screws etc. If dissimilar metals must be used within a plumbing system, connect the two pipes with dielectric connections, which will prevent electrical contact between the two dissimilar metals. If you are uncertain as to whether you have dissimilar metals in your plumbing system, or if you are experiencing potable water that is discolored or stains fixtures, it is imperative that you schedule a plumbing pipe assessment. 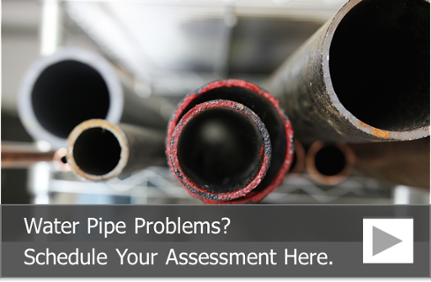 These assessments are extremely detailed and contain a camera inspection of the insides of your plumbing pipes. This can help identify the types of materials used in your system, the amount of useful life left in the pipes and if there is any corrosion or damage to your plumbing pipes. Our building pipe assessment also includes a recommendation for or against plumbing pipe lining, which can help stop future corrosion as well as current and future pinhole leaks, and an estimate for pipe lining. To learn more about how we can help you restore your plumbing system with epoxy liners, call us at 815-790-9000.